Operational Excellence is a management philosophy of Leadership, Teamwork, and Problem Solving, resulting in Continuous Improvement throughout the organization by focusing on the needs of the customer, empowering employees, and optimizing existing activities in the process. The core of the book is based on five years of research by the Treacy and Wiersema into companies, including Wal-Mart, Dell, Southwest Airlines, Home Depot, Intel, and Sony. Market leaders choose to excel in delivering extraordinary levels of one of these three value propositions, while maintaining reasonable standards in the other disciplines. So, what exactly is Operational Excellence? Operational Excellence is a well established management philosophy. It is a philosophy of leadership, teamwork, and problem solving, resulting in continuous improvement throughout the organization by focusing on the needs of the customer, empowering employees, and optimizing existing activities in the process. There are many approaches, frameworks, and models that have been presented under the term Operational Excellence. It is also closely related to other continuous improvement methodologies, such as Lean Manufacturing and Six Sigma. Learn about the 4 building blocks to Operational Excellence: Strategy Deployment, Performance Management, Process Excellence, and High Performance Work Teams. 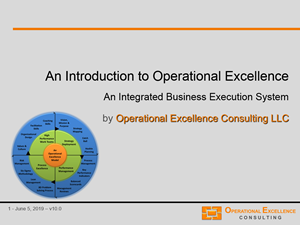 Download a FREE PowerPoint on Operational Excellence. Let's delve briefly into each of these components. Phase 1: Organize the process. Phase 2: Conduct current state analysis. Phase 3: Define strategic vision elements. Phase 4: Develop strategic breakthrough objectives. Phase 5: Determine strategic initiatives and tactics. Phase 6: Implement strategy and review. There are many tools and frameworks assist in the Strategy Deployment process, such as Strategy Maps, Strategic Grids, and Hoshin X-Matrix. Performance Management is the process that translates strategic initiatives into measurable objectives and goals. A powerful tool for Performance Management used in Operational Excellence is the Balanced Scorecard (BSC) framework, developed by Dr. Robert Kaplan and Dr. David Norton. BSC is used extensively in business and industry, government, and nonprofit organizations worldwide to align business activities to the vision and strategy of the organization, improve internal and external communications, and monitor organization performance against strategic goals. Help the management team focus on the execution of their business strategy. Enable an organization to understand the relationship between measures and performance. Reduce the number of metrics to the few vital key performance indicators. Strengthen and formalize the project selection process to focus on key capabilities and enablers. Phase 1: Select the right projects. Clarify big picture using strategic and operating plan. Prioritize projects based on impact, value, resources, timing. Ensure the projects you select have leadership buy-in, etc. Phase 2: Select and train the right people. Ensure the right leadership and ownership. Select the right team leader and team. Develop a training plan, etc. Phase 3: Develop and implement improvement plans. Utilize the right improvement methodology for the right project. Phase 4: Manage for excellence in execution. Stay focused. Frequently review progress. Remove barriers, check real business impact, continuously communicate progress, etc. Phase 5: Sustain the gains. Implement effective control plans. Conduct regular training focused on the process. Review the system effectiveness at least quarterly, etc. There are numerous frameworks and tools for achieving Process Excellence, including full a suite of Lean Six Sigma methodology tools. Examples include BPI 7, 8D, DMAIC, and so forth. Operational Excellence can be achieved and sustained with the right attitude, the right mindset, and the right competencies. In the "Empowerment Continuum," the high performance team has the highest level of empowerment. This requires the team to have sufficiency across the areas of authority, resources, information, accountability. While an organization transitions from a more traditional top-down organization to an organization build around high performance work teams, the role of a supervisor or manager changes to the role of a leader and coach, with six distinctive capabilities: living example, coach, barrier buster, result catalyst, facilitator, and business analyzer. This article provides a very rudimentary introduction to Operational Excellence. To develop a more in depth understanding, we suggest downloading a free copy of the 48-slide Introduction to Operational Excellence presentation and consulting the business training guides below. Flevy's document contributors are Subject Matter Experts in their respective industries. Below, we have showcased our authors that specialize in Operational Excellence and Lean Six Sigma. Each of these authors and their respective consulting firms have developed training guides on Operational Excellence. Allan Ung, founder of Singapore-based Operational Excellence Consulting, has over 25 years of experience playing global and regional roles leading Lean, Six Sigma, and TQM initiatives in global organizations such as IBM, Microsoft, Underwriters Laboratories, and Infineon Technologies. His firm provides corporate learning programs and management advisory services to assist clients to achieve breakthrough in business performance and effectiveness. Operational Excellence Consulting works with government bodies, multinational corporations, and small and medium-sized enterprises of a wide spectrum of industries. Some of their valued clients include Analog Devices, Borouge, Micron Technologies, B|Braun Medical Instruments, Panasonic, NEC, NileDutch, CLS Communication, Elsevier, Wow Education, Ministry of Social & Family Development, Temasek Polytechnic, Defence Science & Technology Agency, Immigration & Checkpoints Authority, etc. Frank Adler, co-founder of US-based Operational Excellence Consulting, has over 20 years of international executive leadership experience in General Management, multi-site Operations & Supply Chain Management, Quality & Customer Support Management, and Operational Excellence, Lean Management & Six Sigma. Frank is a certified and experienced Lean Six Sigma Master Black Belt, with a proven track record of implementing these methods, concepts and tools in various organizations and industries. He holds a in Mathematics and Physics from the Freie University of Berlin (Germany) and a in Applied Mathematics and Industrial Economics from the Helsinki University of Technology (Finland). His firm provides assessments, training solutions, kaizen event facilitation, and implementation support to organizations that are committed to achieve superior performance through Operational Excellence. Vishnu Rayapeddi, founder of Productivity Solutions, is a management executive with over 26 years of experience in End-to-end Supply Chain Management, Manufacturing Operations Management, Strategic Planning, Business/Operational Excellence, and Process Re-engineering/Improvement. Vishnu is a pioneer in Lean Management, combining the power of Lean Thinking, TOC, Six Sigma, TQM, TWI, Balanced Scorecard, cGMP, and other best-class methodologies like DMAIC, Value Stream Mapping, Root Cause Analysis, 5S, Quick Changeovers, Quality and Reliability, TPM, Visual Management, Standard Work, Pull, JIT, and Kanban. Vishnu has worked in Pharma Manufacturing and FMCG Supply Chain environments for over 21 years with some of the most reputed organisations in New Zealand and India, including Unichem Laboratories, Aristo Pharmaceuticals, Intas Pharmaceuticals, Standard Medical & Pharmaceuticals Ltd, Fonterra, George Weston Foods (part of AB Foods) and others. In the past 6 years, Vishnu has been providing consulting, training, coaching and mentoring services in the Operational Excellence arena. Michael Carter, founder of 6ixSigma, is a Six Sigma Master Black Belt with experience in Statistical Analysis, Predictive Modeling, Root Cause Analysis, Design of Experiments, Sampling, Regression, Data and Text mining. His firm has assisted with Lean Six Sigma training and implementation in Australia, Singapore, Germany, China, Malaysia, Taiwan, Mexico, India, Hong Kong, United States, Canada, and counting. Michael is also a Director in KPMG's Advisory Services practice, where leads the internal process improvement deployment and also leads the data analytics initiative, leveraging analytics to identify and improve operational results and assist clients with their operational needs. Flevy is the leading online provider of business frameworks, methodologies, and training guides. These documents are of the same caliber produced by top tier consulting firms, like McKinsey, Bain, and Deloitte. Most documents were developed by seasoned executives and consultants with 20+ years of experience. The training guides selected below have all been developed by management consulting firms specializing in Operational Excellence. The select training guides below have all been developed by the subject matter experts showcased above.